Since the late nineteenth century, hundreds of thousands of Chinese have moved to Russia and Eastern Europe. However, until now, very little research has been done about the initial migrants in the nineteenth century, the presence of the Chinese in Europe and Russia in the twentieth century before the collapse of the 'socialist' regimes or about the great wave of Chinese migration to Eastern Europe and Russia which occurred after 1989. 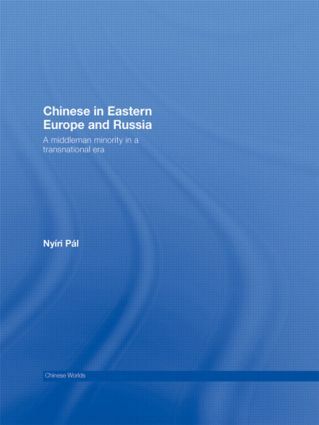 This book provides a comprehensive overview of the Chinese in Russia and Eastern Europe from the nineteenth century to the present day. Particularly important is the movement of entrepreneurs in the early 1990s, who took advantage of unmet demand, inadequate retail networks and largely unregulated markets to become suppliers of cheap consumer goods to low-income Eastern Europeans. In some villages, Chinese merchants now occupy a position not unlike that of Jewish shopkeepers before the Second World War. Although their interactions with local society are numerous, the degree of social integration and acceptance is often low. At the same time, they maintain close economic, social, and political ties to China. Empirical in focus, and full of rich ethnographic data, Pál Nyíri has produced a book that will be of great interest to students and scholars of Chinese studies, international migration, diaspora and transnationalism. Finding a place in Eastern Europe?